- Revitalizing Voodoo Totem fixed. - Dagger in the Back fixed. - Anti-Magic Shield absorb fixed. - Army of the dead ghoul damage corrected. - Harbinger of Doom fixed. - Grip of the dead talent fixed. - Sigil of Silence fixed. - Rain from Above: Fel lance damage fixed. - Consume Magic pain/fury gain added. - Demonic +8sec metamorphosis effect fixed. - Nature's Balance: 50 lunar power out of combat part fixed. - Twin Moons: moonfire spread fixed. - Revive pet/Mend pet glitches fixed. - Shimmer Talent + Disaplacement fixed. - Hand of Protector heal amount corrected. - Judgement secondary effects fixed for holy/protection spec. - Grand Crusader proc now gives 1 charge of Judgement is Crusader's Judgment talented. - Mindbender pet damage and Insanity generation fixed. - Power of the Dark Side damage increase fixed. - Lava Lash script improved. - Primal Primer trait fixed. - Natural Harmony trait fixed. - Tidal Surge trait fixed. - Dark Pact absorb amount fixed. - Fixed an issue that caused permanently rooted bosses to enter infinite "immune" state on wipe. - Mind Control re-enabled in PvP. - Mythic+ loot rewards fixed. - Mythic+ timer display fixed. - Azerith Armors added into Mythic + rewards. - Improved resurrection mechanics inside dungeons. - Fixed a bug when encounter didn't complete if the boss died from non-player damage. - Loss Control display handling improved. - Many, many class damage/heal balance adjusted. - Added proper horde/alliance variants for several crafted items. - Fixed several AoE spells that ignored stealth/invisible units. - Void Elf racial, Entropic Embrace fixed. - Flurry 4th extra damage removed. - Displacement script reworked, several glitches fixed. - Kill Command 25% intant reset fixed. - Aimed Shot damage increased. - Scope and Ammo enchants fixed. - Camouflage script reworked, now works as intended. - Trueshot +1 Aimed Shot charge fixed. - Caling the Shots fixed. - Stealth no longer gets removed by friendly heals. - Beacon of Light fixed. - Master of the Elements bonus damage fixed. - Bone Shield no longer removed from 1 hit. - Penance missing 3. missile added. - Underrot, Atal'dazar and The Motherlode are now available up to Mythc +4! - New encounter available in N/H/M difficulties. - 10vs10 Rated BG queue now enabled on Kul Tiras realm. - During the past few weeks alone, we received a large amount of gold seller reports from our realms, which case seriously disturbs the fair gameplay and requires extra time from our Staff team. Therefor we decided to change our rules, and give account suspension not only for the gold sellers, but also for the buyers. Not being aware of the server rules or ignoring is not an excuse. By confirming the registration on the server players automatically agree with the rules. - Loot handling fixed in 25/25HC difficulties. - 150+ Quest re-scripted inclueded important and epic story lines. - Healing surge fixed for enhancement shaman. - Maelstorm generation fixed from auto-attack and windfury proc. - Windfury proc chance corrected. - Old Expansion Dungeon/Raid Scaling fixed, now increases your damage while you are in old Dungeons/Raids. - Heroic/Mythic items Quality/Item Level fixed, Heroic now drop 325+ Rare, and Mythic drop 340+ Epic. - Fishing fixed and fishing loot added into new zones! - Felguard fixed, now have Energy instead of Mana. - Hand of Gul'Dan fixed, now summon correct amount of Imp's. - Power Siphon fixed, now generate Demonic Core with Sacrifice. - Soul Strike fixed, Felguard now uses his spell when you command. - Bilescourge Bombers fixed, the portal now summon Bombers. - Summon Vilefiend fixed, the damage is increased. - Nether Portal fixed, Soul Shard now summon a demon for you. - Demonbolt fixed, now generates Soul Shard. - Summon Demonic Tyrant fixed, the buff now affect all of your pets and the time increase part fixed too. - Healthstone fixed, now shows the charge of your Healthstone. - Implosion fixed, now can deal damage and can't miss. - Demonic Core fixed, Dreadstalker part work with 100% chance. - Sacrificed Souls fixed, Damage Bonus affect you while demons are out. - Inner Demons fixed, now you summon Wild Imps every 12 seconds. - Soul Shard System fixed, now generates Soul Shard while out of combat. - New encounter added in Normal, Heroic and Mythic(from 22.12.) difficulties. - 4 fully scripted Encounters and Non-encounter NPC's. - Heroic difficulty Loot fixed, ilvl 325 + chance for Warforge/Titanforge. - Mythic difficulty Loot fixed, ilvl 340 + chance for Warforge/Titanforge. 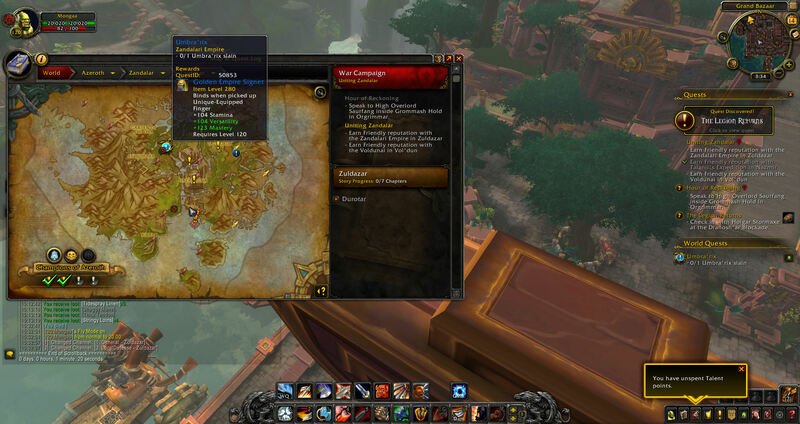 - Dungeon finder implemented for BfA dungeons. - In instance Release Spirit system fixed. - New World Quests implemented. - Emissary Quest system fixed. - Fixed some combat bug issue. - Fixed that issue where Legion items cannot be equiped above lvl 110. - Taunt spells fixed for every class. - Critters and low health creatures now gives you correct amount of experience. - Heritage cosmetic sets added. - Arathi Warfront event start at 18.12. for the Alliance ! - Emissary quests complete and reward fixed. - Soul Cleave fixed, heal coeff using the real numbers now. - Fixed an issue where Throw Glaive didn't do anything. - Backdraft fixed, and re-enabled. - Dire Beast pet damage and attack speed lowered to the retail numbers. - Stormsong story lines, new quests added. - Fix the issue where some old Legion transfered items cannot be equiped, items which still got this issue should be sold at vendor. - Portal Trainers and BfA Portals are fixed. - Soul Cleave heal fixed. - Feast of Souls heal fixed. - Blind Fury fixed, now generating Fury every seconds. - First Blood fixed, now increases the damage of your Blade Dance on the first target struck. - Master of the Glaive fixed, now slow your target. - Chaos Strike fixed, now have 40% chance to refund 20 Fury. - Fixed an issue where Soul Cleave costs more than 30 Pain. - Single target spells now consume Whirlwind stacks with Fury Warrior. - Mortal Strike fixed, applies Mortal Wounds. - In For The Kill fixed, works with Warbreaker too. - Intercept now can be used on friendly targets too. - Focus Regeneration system reworked, used the official blizzlike numbers. - Volley fixed, real proccrate added. - Terms of Engagement fixed, now generates Focus. - Aspect of the Wild fixed, critical strike increases added. - Fixed an issue you cant place pets on the first stable slot. - Infusion of Light fixed, works only with Critical Strike. - Art of War fixed, real proccrate added. - Fix an issue with scalling quest items. - Milling loot fixed for BFA herbs. - Many,many subsystem implemented for World Quest system, release tomorrow. - Sudden Death now let you use only one Execute. - Death Sentence now works on Fury talent too. - Aimed Shot damage fixed. - Flanking Strike fixed, the Hunter now jump on the target and deal damage. - Chakrams fixed, visual added. - Riptide and Chain Heal now applies Tidal Waves on the caster, and can be consumed only by Healing Wave and Healing Surge. - Flash Flood talent fixed, buff applies after consuming Tidal Waves. - Lava Surge fixed, can be procced only by Flame Shock. - Fix an issues with Heart of Azeroth leveling. - CC spell durations and DR system implemented for BFA. - Vol'dun story line fixed. - Tiragarde Sound story line extend. - Dungeon finder fixed, under development Dungeons are now properly closed. - Core mechanics improvement and features extend. - Tiragarde Sound story line, new quests are implemented. - Nazmir story line, new quests are implemented. - Stormsong story line, new quests are implemented. - War-Campaign Scout map implemented and new quests are unlocked. - Stealth mechanics improvements for every related spells. - New Block mechanism are implemented and related talents are fixed. - Every Sargeras Characters/Guilds/Mounts/Companions/transmog will be transfered by default into Kul Tiras, but Sargeras will continue as a Legion server. - All six allied races will be playable and available for Race change also. - All new Continents and Warmode available. - More than 100+ scripted Battle for Azeroth story line quests with cinematics are waiting for you, and this number is counting. - Server rates will be 12x , what you can adjust from 1-12x for your own style.